It’s not what you know, but who knows you and trusts what you say! Looking after your business connections is important for maintaining communications, especially for your ‘news feed’. But does your attention to the news depend on the messenger? In today’s story, we contrast the famous Paul Revere with the not so famous William Dawes. Both went on rides to warn of an impending British raid – one to the west and one to the east. Paul’s message sounded the alarm and alerted the revolutionaries in the west, but William’s message failed to rally the troops to action in the east. The effectiveness of word of mouth can depend on the messenger. By 3 am after Revere’s ride, news had spread 45 miles. Wide coverage in those days! So, Mark, what story have you got for us this week? I’ve got a story that pretty well everybody knows. So, we can relax then. You already know this story. It takes place in 1775, 17th of April, Saturday afternoon. It kind of sounds like Monty Python; I think that’s how they started the movie, The Life of Brian—except it was AD47 or something. Anyway 1775 and there’s a stable boy mucking out the stables in Boston and he overhears two British officers say, ‘there’s going to be hell to pay tomorrow’. Now, the stable boy had no idea what that meant but he did know there would be people who were interested in that conversation. So, he went to the house of a silversmith called Paul Revere, told Paul and the other people who were there what he’d overheard. And for Paul Revere and his colleagues this was like the straw that broke the camel’s back because they had heard rumours about the British intentions to march on Lexington and arrest the colonial leaders, Samuel Adams and John Hancock. Maybe proceed to Concord and takeover the stores of munitions that were there. So, the stable boy’s news galvanised them into action. And so, his famous ride started at 10 o’clock that night and he rode off to the West to rouse the countryside around Boston, letting them know the British were coming and to make preparations to raise the militia and meet the British in battle. And of course, we all know what happened. Riding down the streets he cried out the British are coming. And the next day, the 19th of April the British did march and they were met in battle outside Concord and they were defeated. To their amazement they were defeated by an organised, fierce militia resistance, which had all happened because of Paul Revere’s famous ride. 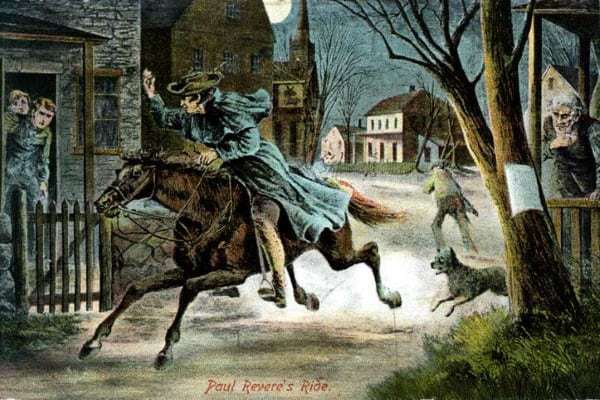 One of the things I love about that example is that Paul Revere was really well-connected. And being well-connected enabled him and his colleagues to figure out that the British were coming. He was able to take action. Now there’s a bit of the story that a lot of people might not know. And that is at 10 o’clock the previous night at the same time that Revere set off to the west another revolutionary, equally passionate, rode off to the east. He went to towns, he rode the same number of miles, knocked on the same number of doors, spoke to about as many people as Revere and yet nothing happened to the east. So why did Revere ride off and have such amazing impact and William Dawes, who is consigned to history, into oblivion, have no effect? And the answer is Revere was very well connected. He knew what doors to knock on. So, he knocked on the doors of the local colonial leaders. They immediately knew who he was, they trusted what he said and acted on his words almost immediately. To the extent that by 3 am that night the news had spread over 45 miles which is a lot. In the days of horse and foot that was a lot. William Dawes on the other hand didn’t know people, people didn’t know him. He didn’t know what doors to knock on. When he did knock on the right doors after being directed there, people were going ‘who are you and why should we believe you’, to the extent that people thought, after the event when they looked back, that that area that Dawes visited must have been very strongly pro-British. But, it wasn’t the case at all, it was simply that Dawes wasn’t well connected and people didn’t believe him. So, it’s a really important part of the Paul Revere story that reinforces just how important it is to have really strong connections. They enable you to find out what’s going on, they enable you to take action when you need help from other people. So, invest in your relationships. Absolutely and invest in them before you need them right. You can’t create those relationships on the day of the ride. As poor William Dawes found out. Fantastic, excellent. So, let’s talk about what we liked in that story. What bits make that story work? For me the first thing that jumps out is that it’s a historical story that we know happened and that a lot of people know. So, it’s kind of got that familiarity about it. You know even phrases like the ‘British are coming’, these are well known phrases that immediately mean something to us. So, I think that really helps a story like that. The other thing too which I think is great about that story is just the details. You know talking about the Lexington and Concord and munitions and all those layers of details that you provide in that story just make it more credible. It’s a bit like when people say to me’ there’s a story on one side and then there’s the data as if they are separate things. As we know a good story has both those things delivered with some emotion. Yeah, facts wrapped in context delivered with emotion. And so, a lot of that fact was taken from Malcolm Gladwell’s book “Tipping point” and from a whole bunch of other sources that I’ve cobbled that version together. When I’m telling that story in a keynote situation I totally use all those details because they definitely add credibility. Indeed, but here’s the other really interesting thing about that is you could tell the non-detailed version and while it may not have the same punch, it would get across the idea in a similar way. Like just having a chat with some colleagues at a meeting and you sort of say it’s so important we connect, it’s a bit like Paul Revere, you know what happened there, he did the ride and was able to inspire all this action but at the same time this poor fellow William Dawes goes and does the ride around Boston, knocks on the doors and no one’s interested because he wasn’t connected. You know you can tell that tiny 30 second version of the story and people get the idea, don’t they. Absolutely, so that short version is very easily tellable. It’s very easily accessible. So, I think this is a useful point for our listeners, that understanding the circumstances in which you are using this story will often govern the way you tell it and of course the point as well. So, if you are giving a keynote presentation to hundreds of people then you can really amp up the details. You would have images to support it etc and so that’s one application. A completely different application is in a meeting where you want to encourage people to work together more effectively. And in fact, if you were at that meeting and you leant in and said 1775, they would roll their eyes and just look at you like you were crazy. Not only that, they would be suspicious of you because that’s not how we speak to one another when we are in a meeting. We speak in a more informal colloquial way and not with all the details so I think you have to be quite careful that you don’t try to use a big story for a small space. Absolutely and this should be a source of relief for our listeners, in that you don’t need to remember all these details to use that story effectively. You can tell a very very short version that gets the essence of the story across very quickly and very effectively. Now I think one of the other elements of this story which I love is the contrast. We know we love contrast in our stories. So, you are starting off with the Paul Revere story, we’re very familiar with that and then you finish that and you tell another story and it’s essentially two little stories that make up the whole and it’s a nice contrast. And it’s the contrast that helps make the point. Exactly. So, there’s some really nice speeches; Malcolm Gladwell is a master storyteller. It’s not surprising that he can pull out those interesting connections that you don’t normally see. And there’s probably something of a relief for people to know that you just don’t need to have all the details because remembering all those details is an encumbrance sometimes. So being able to tell that story very quickly without needing to know all the details is a great one for your kit bag right. Put that in your back pocket and you can tell it anywhere. What do you think you could do to make that story even better? Is there anything you might change or emphasise. I think for me I would like to know a little bit more about Paul Revere. You know you could sort of say he was a short little 50 year old guy with grey hair, I don’t know what he looks like I’m just making this up. Some sense of his character. Yeah, exactly so people can picture him a little bit, you know the whole imagery side of storytelling. Apart from that I can’t think of anything else you’d probably want to add. And you don’t want to overdo it. No, you could lay too much into it, couldn’t you? So that borrowed heavily on Gladwell’s telling so it’s pretty well told. I don’t think that there’s a whole bunch to do to make that story any better. Practice it a couple of times obviously, be cognisant of the situation you are using the story, so if it’s a meeting just go with the short version. Just going back to one of the things about that story that helps make it work is the element of surprise. And I deliberately tried to ramp up the surprise, that there’s a version of this story that you already know and then there’s the bit that you don’t know yet. So that bit of surprise was one of the elements I tried to weave into that telling. Okay what about business points, where might we tell this, what’s the situation? Well Paul Revere and his revolutionary colleagues were seeing their world was about to be disrupted by the British and being well connected helped them deal with it. That’s right. They were able to adapt weren’t they, they could inspire action. I do like the sort of approach of attaching to the character of a team or an organisation; I think that works really well. Fantastic, I think that’s the main reason for telling that story. I think there would also be many organisations that are looking at approaches around networks and communities of practice and that story is very effective in illustrating why those groups are so important to an organisation. Working alongside the formal structure. Absolutely. It’s kind of a sister story to our 9/11 story we told right at the beginning of this podcast series; the importance of being connected to being able to adapt to the unexpected. One of the things about that story that I like is that I read it in a book, a book that many people have read. And just taking note of these stories as you read them is a really great way of building your repertoire. O.K. let’s go for a rating on this story. I like this story. I haven’t told it many times. Since I heard it (probably when the Malcolm Gladwell book came out) I wouldn’t have told it more than 3 or 4 times. So, in terms of usability I don’t use it that often but I think it’s a good story. I’d give it a 7. It’s a solid useful story. The thing about this story that worries me is have too many people heard it? Is it surprising enough to an audience? It’s the curse of knowledge. Because I know it so well I assume that everyone else knows it but that’s not true. But that’s the thing that goes through my mind. Would I feel comfortable telling it so people go I’ve not heard that story? Likewise, I would give it a 7 and would also support you in that cautionary note about how frequently that story might be used or whether it’s become hackneyed or not. I don’t think it has but we need to be aware of this. And if a story is overused its impact is greatly reduced. There is a risk with that story that it be or might become overused. Other than that, I think it’s very useful. Tell it to a lot of young people who have never heard of Paul Revere. Well guys, I think that’s where we’ll wrap it up so thanks again for listening to Anecdotally Speaking. And tune in next week where we share another episode of how to put stories to work.